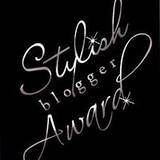 Last week I was honored to be awarded The Sylish Blogger award by not one but FIVE very stylish bloggers - Kim from Chattafabulous The Green Room Interiors, Diana from One Crafty Fox , Stephanie from Moxie Maley, Barbara at Hampton Hostess and Cathy at Stitchfork. I feel quite tickled that five such sweet and talented women threw my name in the mix - Thank You! If you haven't visited their blogs, take a skip over - they are all just great. The acceptance of said award comes with a few conditions - you must link back to the presenters of said award, list 7 things about yourself, and nominate 5 more people. Now, it's hard to think of 7 things I haven't already told you about myself that you might find remotely interesting, especially because I've participated in a few of these reveal things before but I'll give it a whirl. I'm going to try and correlate the fact with the number just to make it a little more fun. One - I won 1st place in a dance contest when I was a very little girl, a speech contest in highschool and a photography contest in college. Two - I have known my 2 closest girlfriends for at least 38 years or more. Three - I live with 3 health issues, thyroid disease, celiac disease and fibromyalgia. Four - When I was little we had 4 dogs at one time - Brandy, Kato, Scamp and Muffin, they were doxie/beagle mixes and crazily fun. Six - Four generations of women in my family have been born in a year ending in the number 6. I was born in 1966 (in the U.S.), my daughter in 1986 (in the U.S.), my mother in 1946 (in England) and her mother in 1916 (in Ireland). I may have mentioned this before but I find it fascinating - wasn't planned. 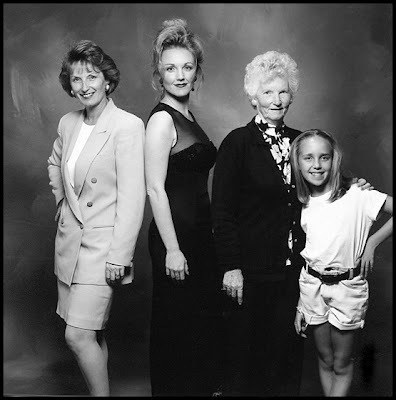 Above is a four generation photo of us obviously from a loooong time ago because my daughter on the far right is now almost 25 (l to r - my mom, me, my nana and my daughter). Seven - 7 things always in my kitchen are - eggs, orange juice, bananas, steel cut oats, apples, onions and garlic. Instead of passing it along I'm wondering what is one thing that can always be found in your kitchen???? Chocolate! In some form or another, you will always find chocolate in my kitchen. Right now, I have some Ghiardelli Peppermint Bark leftover from Christmas. I am eating them slowly. Celiac is very dominant in my family. My mom, maybe sister, uncle, and my cousin have it. I have been tested for it a couple of times and it keeps coming back negative, but the genetics are so strong. It's a tough disease. Cereal... the kids/hubby love cereal. There is never less than a variety of 4 boxes at a time. I know you do Deb! I used to love cereal, frosted mini wheats were my fav' but my gluten free life got rid of those. I'm probably better off for it. Noodles... Sad but true. They are my diet nemesis! That's a great photo! you guys are all a knockout! Something that can always be found in my kitchen... definitely coffee. Jeanette! That photo is perhaps one of the best family photos I have ever seen!!!! My kitchen is never short on Tea, lots and lots of tea. Congrats on your 'Stylish Blogger' award! Well done thinking of such a clever way to list your seven 'things' about yourself. OOOh! so glad you posted a pic from a loooong time ago!!! Thank you for the compliment Nicole... my mum, daughter and granddaughter - all knockouts on the inside! One item I always have in my kitchen - teabags from England! very fun facts, except for the 3 health issues, of course. love the photo, you all look fab! what's in my kitchen? now that i am married, a shelf that looks like a 7/11 store. Congratulations! Love hearing more about you!! And what a beautiful photo of your family and you!! Congrats! In our kitchen, you can always find carrots and celery (the hubs will not have a kitchen without those two) but I'm always stocking up on lemons - I use them in so many things! What a nice job relaying the 7 interesting things about you. Very creative. The photo of the four of you is absolutely lovely. Such a fine looking group. I love how you put this all together, very creative and very fun. Sorry to hear about your 3's though. I have a thyroid thing too. One thing you can always find in my kitchen is Green Tea... rather Japanese green tea with rice. So yummy!! I always have dairy products: milk, creamer, cheese and apples to pair with them. aww, how interesting to know more about you! i love these but who doesn't :) I think one thing I always have in my kitchen is wine. and tomatoes. Ok, I have to ask, how do you make your steel cut oats? I've been looking for a recipe for the longest time! Do you do them in the crockpot at all?? Hi Jen, I just make them in a large pot. 4 cups of water to 1 cup of oats, bring to a boil and simmer till done. This makes a couple days worth for two of us. Chocolate, hooray for chocolate. That picture is great, Jeanette! Woo Hoo! Congratulations! You so deserve it!! LOVE the photo! Just LOVE it! K- strikin' a pose and all! LOVE it! In my kitchen.....bread for toasting and tea! Great pic! And fun knowing more about you. The six in years is fascinating. What's in my kitchen - seems like a full grocery store of items when all my sons are home! What a fine-looking bunch of women! The one thing (two things) always in my kitchen is chocolate and coffee. Before I even read your question I thought to myself, "Garlic. How does anyone live without it." At times I will use so much that the next morning in yoga I swear I can smell it seeping out of my pores. you are one stylish gal!! my kitchen always has cereal (a variety), peanut butter, bananas and Kraft Mac & Cheese. sorry to hear of your health issues - I've always knocked wood that I haven't been hit with anything so far, especially since my sister is type 1 diabetic and my guy's 3 siblings have a genetic disorder. I'm SOOOO envious of your women ending in year 6 birth trend. My family has it too - tons of women born in the year of the horse. But I wasn't - I'm an ox. Yay! Well-deserved award! The kitchen always has chocolate bars (for baking), French Sea Salt, Dijon Mustard and lots of whatever I find at the market. I adore your family photo....it's a lovely lovely photo...! Oh, I love these things! First, you look like Sharon Stone in that picture! What beautiful ladies the four of you are. Sorry to hear about the health issues. You'd never know from your wonderful positive attitude. And your right, you are better off without all the wheat products. Always in my kitchen - like you, I always have eggs, onions and garlic. Also apples, tea, coffee, chocolate, milk, olive oil, and veggies and brown rice. And thank you so much for the lovely birthday wishes! Shallots, rock hard baugette from yesterday, half bottle of red, sea salt. Wilting arugula, basil, marjoram and thyme. French roast coffee, bananas and creme fraiche.